Established in late 2008, Hire Fitness Ireland in Cork is the Irish franchise of this highly successful network of home fitness hire suppliers. Backed by a tried trusted range of equipment and the knowledge and experience of over 10 years UK experience. Run by Paul Sweetnam and the team in Youghal, Hire Fitness Ireland has the ability to cater for all your fitness needs. 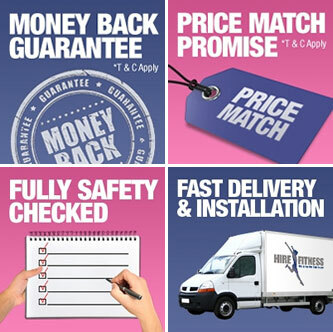 We supply, install and deliver Nationwide, normally within 24-48 hours of receiving your order. Hire-Fitness in Cork: Achieve Your Fitness Goals Becoming fit and healthy is an ambition that we should all aspire to in life, but it can be complicated attempting to find a routine that fits our individual schedule. Attending a weekly or daily session at a local gym can be beneficial to some people, but these days many of us simply do not have the time set aside to find a location that offers the right equipment, support and regime that suits our specific needs. Because of this, many people struggle to implement their fitness plans, regardless of how keen they initially were about the concept of taking control of their health. Rushing into a decision on what to do about your fitness goals can lead some people to costly mistakes, such as purchasing expensive pieces of equipment that we find are not suitable for us later. That is why choosing to rent or hire fitness equipment on a weekly to monthly basis can be a convenient and effective option when it comes to achieving your health targets. A company dedicated to providing you with the best possible customer service, Hire Fitness in Cork is here to help you make the most out of your body. With a variety of fitness equipment to choose from so that you can construct a regime tailor-made to your specific needs, including treadmills, cross-trainers and exercise bikes, you may find that hiring with us is the first step on the road to success. When you hire gym equipment, you have it conveniently at hand whenever you may be ready to start a workout, meaning that you dont have to rely on finding a gym that suits your schedule. Better than simply buying the equipment, hiring gives you the option to try various different machines at your own pace to see if they suit your exercise routine, fit your space, and meet your requirements. If you find that the first piece you hire isn't for you, the next week you can swap it out for something different without any hassle. On the other hand, maybe you love having an exercise bike the first few months of your fitness routine, but want to try a treadmill later in the year? Whatever feels right for you, you can accomplish it with Hire Fitness. Hiring is also a healthy alternative for your budget. The low monthly fees mean that you dont have to hand over a large amount of cash straight away to get started on a fantastic fitness regime, nor are you tied to a contract for a period of years, shelling out money at the gym. If your situation changes, a hire contract that works on a weekly or monthly basis means that you have the flexibility to decide whats right for you. Economically and environmentally friendly, as you wont have to look for ways to dispose of old machines later, hiring fitness equipment can take a load off your weight, and your mind. What Kind of Equipment Can You Access? Treadmills: Treadmills are one of the most popular forms of home exercise equipment, as they provide an efficient, straight-forward, and simple aerobic workout. A great option for beginners who are just getting started on a new exercise routine, treadmills provide excellent exercise regardless of your level of fitness, and as your strength and endurance begin to grow, you can push your limits further. Cross trainers: Designed to improve the tone in various areas if your body with low-impact, fluid motion, cross-trainers make for a great cardio workout, enhancing heart health, bone strength and increased lung capacity. Exercise Bikes: A stationary exercise bike can provide an easy workout for individuals with joint problems. Fantastic for a little bit of extra fitness, you can use these machines while youre watching your favourite television program and pedal yourself into shape.